Photos from a campground we stopped at . . . In the Spring of 1993 we were living in a Milwaukee suburb when the largest waterborne disease outbreak in US history occurred. Cryptosporidium had slipped through a Milwaukee water filtration facility — Howard Avenue Water Purification Plant (which I had actually visited with a high school science class years before). The outbreak killed over 100 people and made many more people ill and severely ill. Though no outbreak of this severity has occurred since 1993, there are still instances of “bad water” in this country. Here’s info from the EPA. Though I didn’t get sick in the 1993 outbreak, I knew people who did, and the outbreak became a “Come-To-Jesus” moment for me & water. That said, I wanted to make sure our RV had an good water filtration system. 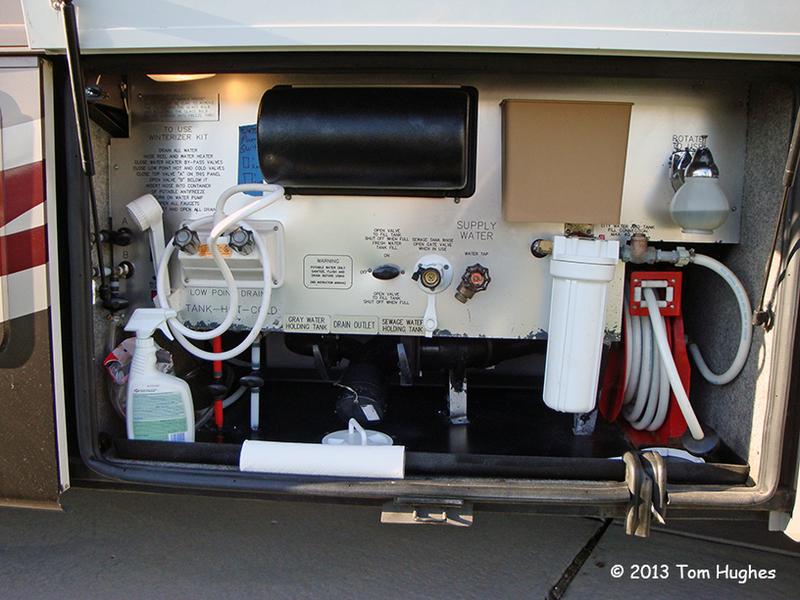 Our 2001 Newmar came with a single, canister-type water filter which I thought was totally inadequate. (A) Watts water pressure regulator — which limits the incoming water pressure to a predefined (typically 60 psi) limit. The water pressure at some campgrounds is so high that it could damage RV plumbing. (B) Sediment filter — used to remove particles in water that are 1 to 5 microns in size. (C) Carbon block filter — besides improving the taste of water, a high quality carbon filter can remove chemicals, bacteria, giardia and cryptosporidium cysts, or lead and heavy metals. (D) Water softener — like a home water softener, turns “hard” water into soft water by replacing the calcium in water with sodium. 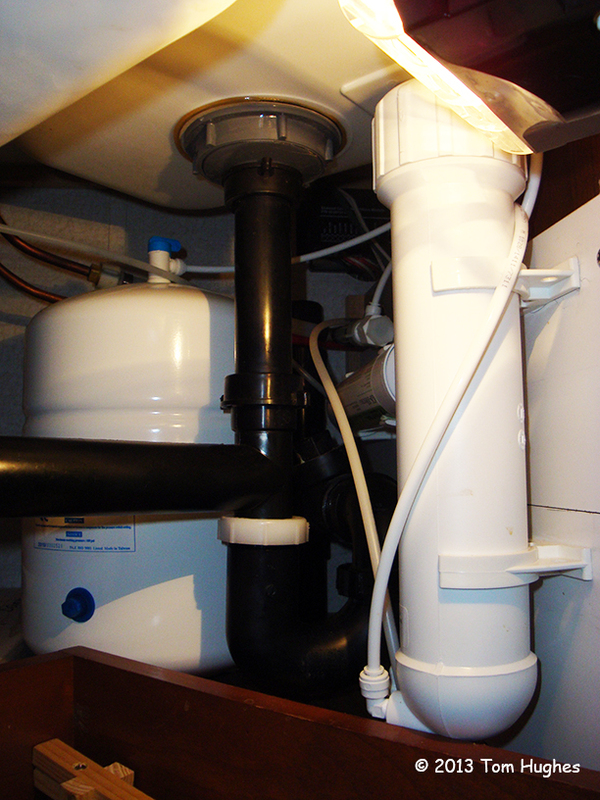 Softening water can prolong RV plumbing as well as making it easier to wash clothes and to shower. (E) Flow meter — besides just looking cool, the meter measures water flow in gallons per minute. I thought I needed the flow meter to figure out how good of a UV water filter (my next filtration purchase) I needed to buy. Also, when I’m filling up our 100-gallon water tank, the flow meter lets me estimate how long it will take. This can come in handy when there are several people behind you waiting to fill up their RV water tanks. (F) UV Filter — essentially sterilizes water using ultraviolet light. Effective UV disinfection will neutralize bacteria and viruses. However, to be effective water entering the UV chamber should be as “clear” as possible so it’s placed after other filters. The Sterilight Cobalt SCM-200 filter I used is rated at 8 gallons per minute (gpm) which is the maximum rate that water can flow through the UV filter. I installed the flow meter to monitor water flow, but so far flow rates have been at most 3 to 4 gpm. 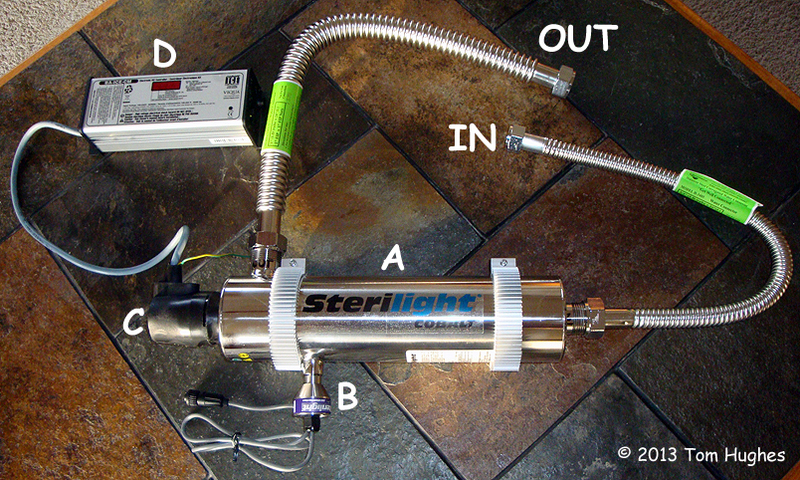 The major parts of the Sterilight are (A) the stainless steel chamber, (B) UV intensity meter, (C) UV bulb, and (D) UV intensity monitor which lets you know when to replace the bulb. I also added an under-the-sink Reverse Osmosis (RO) unit which consists of a RO membrane (or filter) and a 3-gallon storage tank to hold the filtered water. Using just water pressure (about 60 psi or more), an RO unit removes dissolved minerals and salts and creates highly purified water. However, one criticism of RO is that it can waste a lot of water. For example, more than half the water entering an RO system may end up as waste water. 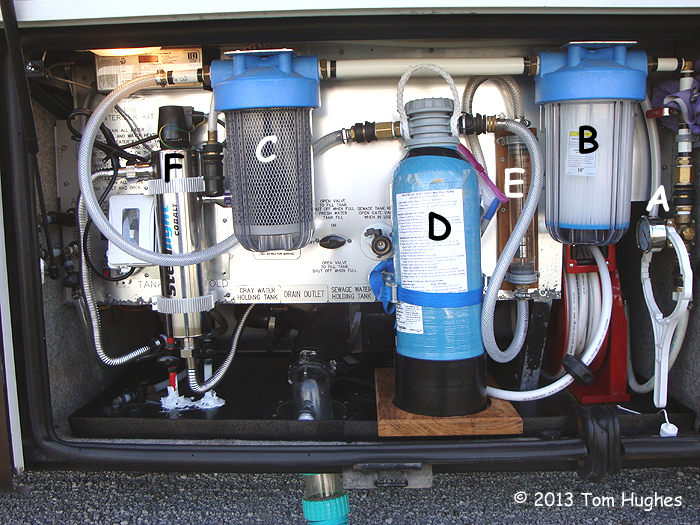 One way stop this waste in an RV is to plumb the waste water back into the water holding tank as shown in the diagram below. Great system and something many RV’ers probably give little or no thought about. Hooking up to campground water systems is usually safe in that all states pretty much adopt and mandate EPA rules to public water quality… but you never know. I like your system, we have a similar system in our Fleetwood Expedition from the same company. 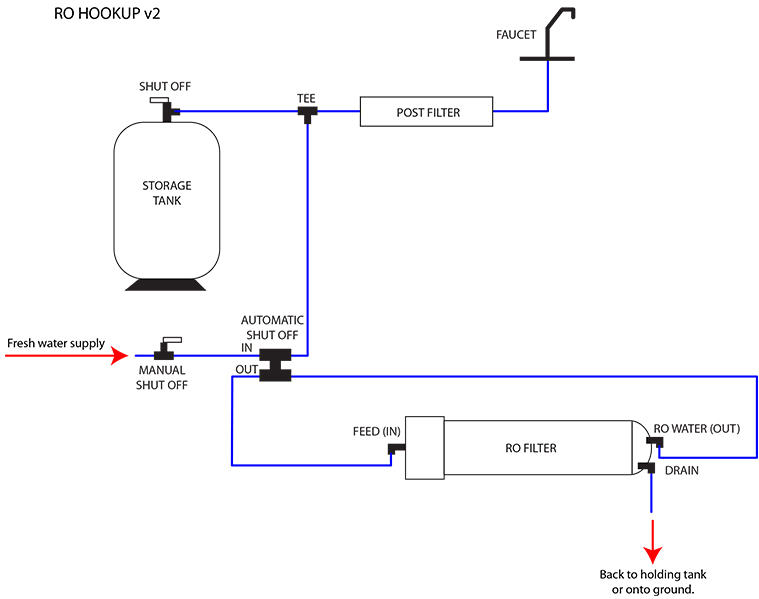 Thank you for the diagram of the RO, We will be adding an RO to our system.